In a glamorous twist on the classic Breton top, this Marina Rinaldi version features a tunic cut and two stripes of glimmering gold. 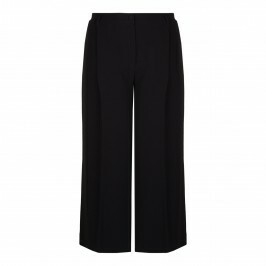 Pair with black wide leg culottes and loafers for a chic and stylish ensemble. Black, gold and white stripe knitted tunic. Oversize cut. 43% Wool, 43% Acrylic, 12% Acetate, 1% Polyamide, 1% Polyester. Cold hand wash.